With apologies to Kermit the Frog … sometimes it isn’t easy to know how to be “green” correctly. You’ll begin to notice new blue and green receptacles, in the new meeting rooms and at coffee hour on Sunday mornings. But what goes in them? 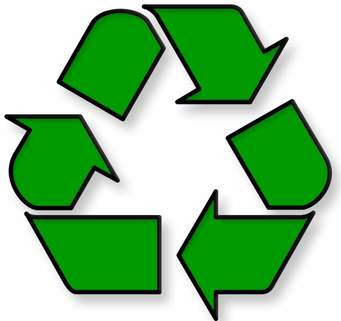 First, anything with food or beverage remains is NOT recyclable. That paper cup with just a bit of coffee or juice – nope! That paper plate or plastic fork covered with cake or cheesy-something or whatever – nope! Food leftovers clog up and contaminate the recycling chain. But into the blue containers, you CAN place clean paper goods – bulletins, dry paper cups, clean paper plates, unsoiled napkins – no used tissues, please! The green containers take clean plastic, glass and metal, even food containers as long as they’re rinsed out and dry. Again, food (even a little bit) contaminates other items, and drips of water contaminate paper. Anything else, like it or not, is trash. Don’t put it in the blue or green receptacles. Put it in one of our trash cans. Thank you for being green!